BALTIMORE Vending Machine Companies! 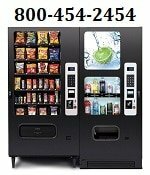 Offering FREE Vending Machines: Snack, Soda, Coffee, Deli, Drinks, Food, Frozen, Healthy Vending, Micro Markets, Amusement Games, & Repair services for your employee breakrooms! Alliance Vending Services – Full line vending services, we are based out of Baltimore, MD. Columbia Vending Service Inc. – Vending Equipment services, Based out of Baltimore, MD. JAG Vending – A full line vending machine company, based out of Baltimore, Maryland. VendMedic is a trusted source for vending machine repairs. Our technicians combine to have over 60 years of experience, making VendMedic the preferred maintenance company for major companies and government agencies, not to mention for most privately owned vending companies. Our wholesale division can sell you machines and the parts you need to manage your own business! Call today @ 844 999-VEND (8363)! Visit www.VendMedic.com.